Note (12/11/08): The "favorite places for field work" Accretionary Wedge is now up, here. Head over for more delicious geologizing. 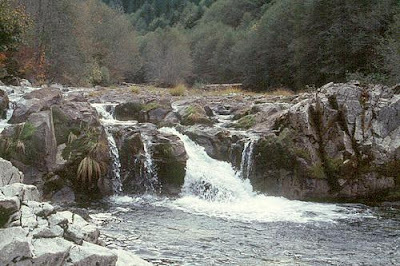 Quartzville Creek. I'm pretty sure this was taken from the road up Boulder Creek. From here. So the late-late edition of the November Accretionary Wedge is coming out... and I'm running late. I don't have a digital camera, and all my slides were lost a few years back, so all the photos are from things I could find on the intertubz- I did figure out how to get an image from Google Earth into a useable form. So let's start with that. This image shows the forearc basin of the central Willamette Valley, east to the current axis of the Cascade arc, and a little of the east Cascade flank, as well as a little of the forearc ridge of the Coast Range along the western edge. Mt Jefferson, a large stratovolcano that hasn't been active since the Pleistocene, is clearly visible in the middle of the eastern side of the image. Current arc volcanism is restricted to the axis of the arc, though there has been substantial post-Pleistocene activity (from what I know, probably back-arc spreading) on the east side of the Cascades. Newberry Volcano, off the southeast corner of the image, may represent interaction of Cascade and back-arc magmatism along the northern boundary of Basin and Range. 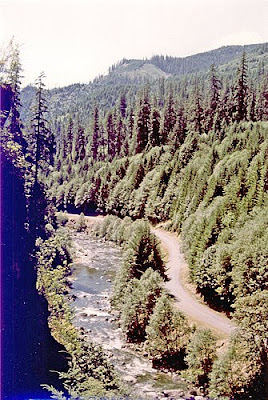 Looking east from a peak near Sweet Home, Oregon, up the drainage that includes Quartzville Creek and toward the Cascade crest. (Full-sized here, highly recommended) From left (north) to right, major peaks are Jefferson, Three Fingered Jack, Washington, Three Sisters, and Bachelor. A closer view of the center of the district, with the town site marked. Yellowbottom (a ludicrously optimistic name for a very poor gold area) is near where the stream leaves the map in the lower left corner. Most of the area near the town site is composed of quartz breccia; little of the original host rock remains recognizable. The rocks and landforms in the High Cascades are certainly fascinating. But there's something to letting erosion do its thing for a while. You get to see the guts and plumbing of all the stuff that's underneath. I'm not certain where this spot is, but you can see a couple of dikes in the lower left. I also see a very nice swimming hole- the water here is much deeper than it looks, I'm guessing 12-15 feet. From here. One of the things that has struck me over and over is that we tend to think of arc volcanism in terms of, well, volcanism: basalt, andesite and rhyolite (mafic to intermediate lavas are most abundant, but rhyolite is not uncommon). But when you get on the ground, various incarnations of volcanoclastic sediments make up about half of what you see: breccias from landslides and lahars, moderately to poorly sorted sandstones and siltstones, even well-sorted mudstones (which I take to be lake sediments). I first visited this area in spring of 1982 with the OSU Geology Club- more of a sight-seeing tour than anything else, but soon afterward I found this field guide (7 Mb PDF) at the library, and returned frequently. The thing that makes the Quartzville area particularly interesting is that a late-stage intrusion (about 18 Ma) emplaced a granodiorite pluton that set up a hydrothermal system. So not only can you see the guts of an arc volcanic system, you can see a range of mineralization from unaltered to complete replacement with quartz. This is not a rich district: 30 years of on-and-off mining in the late 1800's produced about $200 thousand worth of gold and silver. But that means that no great blocks have been removed or left unsafe to investigate. Waterfalls a few hundred yards upstream from Yellowbottom. The dominant bedrock here is granodiorite- one of only a few places in the Oregon Cascades where granitic rock is exposed. A number of basalt dikes also run through this area, and have produced some fascinating examples of differential weathering and erosion. The basalts erode more easily, and have left deep trenches several feet wide through the granodiorite. This is also a GREAT swimming hole. From here. 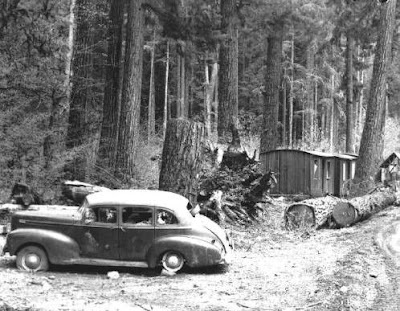 A cabin near the Quartzville townsite, 1952, from here. A more modern picture, I believe near the Yellowbottom falls (pictured above), from here. The cue I'm looking at is that log stranded up on the rocks; we had a tremendous series of floods in late winter of (I think) '98. Logs several feet in diameter were stranded 10-15 feet above the normal waterline, and I'm almost positive I recognize this one. On the other hand, abundant timber resources (as seen in the two pictures above) ensure that there is a terrific network of access roads, even though the landscape is forbiddingly rugged. You can get to within a quarter mile or so of almost anywhere in the area without leaving your car. Quartzville also holds a distinction in that it's one of a very few places that I've actually been paid for doing field work. In fall of '87, a minerals company decided to to a reconaissance soil geochemistry survey that pretty much covered a few square miles of the center of the district, so I actually got paid to go collect dirt, look at rocks and camp. Nice! As it happens, Black Monday occurred about a week into the project; our supervisors were, let's say, very excited. As it turns out, the project was a scientific success- there were lots of interesting patterns that emerged from the data- but an economic failure. Lots of funny stories... my field partner and I decided to pocket our per diem (and save two hours of driving time each day) by camping near Yellowbottom rather than staying at a hotel in Sweet Home. Overall, it was more than worth it, but washing yourself (especially face and hair) in water that's only a degree or two above freezing is... bracing. I could feel my scalp trying to crawl away, a very bizarre sensation. We had horrible, horrible altimeters (This predates GPS by what? 10 to 15 years? )- we came around a corner one time, out of a still forest and onto a windy, exposed, sunny area, and the altimeters dropped 200 feet. So my partner and I decided very quickly to use sighting and triangulation rather than even looking at those useless gadgets. We had one rather long traverse- about 2 miles- across an area that didn't have much distinctive landscape along the way, and we were counting on prominant features across the valley to keep ourselves oriented. When we finally came out to the road, we were less than 10 feet vertical off from where we expected to be. Meanwhile, the same day, two other teams actually crossed paths without realizing it. Since we were contour sampling at 200 foot intervals, that was considered a fairly major boo-boo. Looking at my options when I graduated, I just wasn't convinced that geology was the direction I wanted to go. I eventually went on for a Master's in science education. Geology was and is my first love, and I hoped to get into a position to do geology education. Didn't work out so much as a career, but I have done about 40 field trips up to Quartzville with groups ranging from age 10 to retired. The trip I have done most often is with middle schoolers. The area offers a great opportunity to think about volcanoes' physical aspects in terms other than simply the cones they create; a wide variety of rock-forming environments (or rather, the products of those environments); a spectacularly scenic area; and a tremendous array of rocks and minerals, ranging from secondary zeolites and calcite in basically unaltered basalt, to pyrite, tourmaline, sphalerite and galena, up to drusy quartz veins 10 feet thick, rising like fins on the mountainside. So even though I was a little puzzled about how to approach "field work" for the accretionary wedge, I have done field work here, and "field education laboratory" is close enough. A hydrothermal breccia up Boulder Creek Road that is well known as an easy place to find and collect pyrite. Typical sizes are about the size of a lentil to the size of navy bean, but I have seen samples here up to an inch across. Smaller crystals have better form- which is always in pyritohedrons at this site. Crystals from the quarry near the bottom of the road are always cubes. Another geologic imponderable. It wouldn't surprise me if one of these kids was introduced to this spot on one of my field trips: I've probably taken 500-600 people to this site. From here. I think that's enough for now, but just as a taste of a future post I've been wanting to get to for a while, you might guess that the combination of volcanic sediments and shallow water depostion (The Willamette Valley was a bay during this time) might make for a good fossil assemblage, and you'd be right. The diversity of fossilized wood is mind boggling; in fact, it presents something of a problem. This is the source of the one publication I have in (what I would consider) the mainstream geological literature. But more on that some other time. It's been about ten years, but I hiked quite a bit in the Quartzville area. Gregory Creek? I think is a trail that takes you up the backside of Rooster Rock. There was an old shelter up there, but it fell over. Lots of juicy thimble berries in the open clearcuts. I learned something new, I think. Are We Going to Get Winter This Winter?